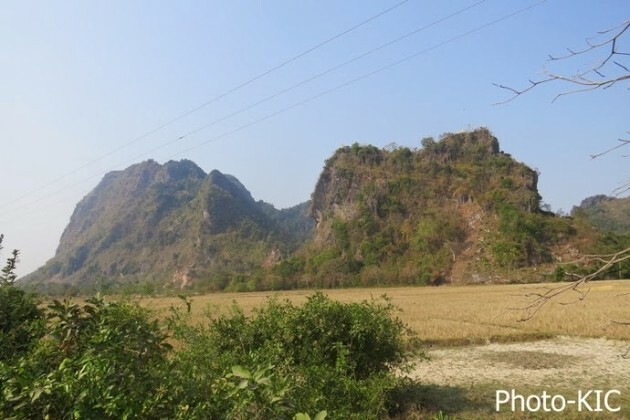 Residents from Lun-Nya village area, in Hpa-an Township voiced their opposition to a proposed cement factory planned for their area, over concerns that it could endanger their health and fears that they would receive no compensation. As many as 300 villagers raised their concerns at the meeting attended by representatives from Ultra Tech’s Cement Factory and ministers of the Karen State Government. Ultra Tech, an Indian company, proposed the building of the cement factory on Lun-Nya Mountain, close to the village. It would be the third cement factory in the area – with two military owned factories already operating in nearby in Myaing Kalay village. The villagers used the example of the military owned cement factories at Myaing Kalay village, which they said had made locals sick and had received no compensation from the authorities for damage to their lands. “Using Lun-Nya Mountain for a cement factory construction is unacceptable to local residents and monks. Currently the Myaing Kalay cement factory that is owned by the military provides no compensation to local residents. The residents have been suffered various kinds of illnesses caused by the destruction of the natural environment,” Saw Than Htay, a local resident of Lun-Nya village, told Karen News. Saw Than Htay said that the two military owned cement factories constructed in Myaing Kalay the west of Salween River has caused pollution. The Lun-Nya village residents rely on the environment for water supply, hunting and gathering jungle food said that could be facing difficulties if the cement factory constructed on the Lun-Nya Mountain. Saw Kyi Lin, the Minister of Karen State’s Department of Electricity said that the cement factory proposal would consider the potential impact to the environment, the pollution levels and the impact on locals peoples’ lives. “The meeting is for the company businessmen come to [listen] and observe the resident opinions [before] they come to construct the cement factory. The cement factory construction will be considered with an environment protection, no contamination and to be constructed with new technique system if it is approved to proceed,” Saw Kyi Lin said. Saw Khin Maung Myint, Karen State Minister of Transportation, said that local residents would have the final say in the decision to build the factory. Ultra Tech’s Cement Company proposed project is estimated to cost US$ 500 million and will take three years to construct, if the proposal goes ahead.